Chan Pelton didn’t get to keep the ring, either. Poker-chip capers aplenty have been in the news in recent weeks. First it was the ongoing saga involving the massive quantities of fake chips inserted into a Borgata Winter Poker Open tourney by North Carolina player Christian Lusardi, and this week two more stories involving poker and casino chips have developed, in North Carolina and Maryland. We’ll return to the Maryland story early next week, as it’s still developing and other and larger poker issues are hot off the presses, but the Florida tale now seems complete. Twelve days ago, in Event #9 of the World Series of Poker Circuit (WSOPC) stop at the Palm Beach Kennel Club, officials discovered that the initial winner of the event, Chan Pelton, had palmed at least one of the “25,000” chips late in the event, purportedly as a souvenir. These were among the largest-denomination chips in play. 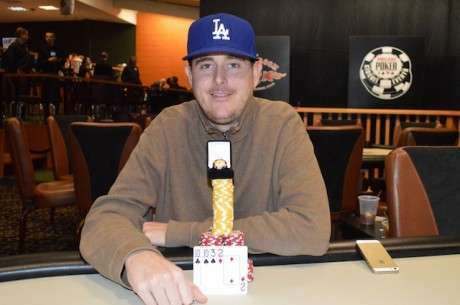 When questioned, Pelton admitted he’d taken the chip as a “souvenir,” and that he had a table in his living room decorated with all sorts of tournament chips similarly palmed from other events. As one would expect, the practice is highly frowned upon by casinos and poker officials, because chips removed from the poker stacks of one event can be reinserted into later tournaments at the same casino, if the same chip set is being used. Even a single 25,000 chip such as the one Pelton admitted swiping would represent several buy-ins of tournament equity if snuck into another event at a later date. The PBKC and WSOPC immediately froze Pelton’s official first place-prize of $47,061, pending deeper investigation, the results of which were seen in the joint statements issued by the two parties on Wednesday. That friend turned out to be wrong. Whether or not the chip was truly intended as a souvenir, Pelton’s winnings were confiscated, with the first-place money instead going to prior runner-up Chris Bolek, with a subsequent increase in prize money being awarded to all the other in-the-money finishers as well. So why was the prize money forfeited? That’s the part of the story that took nearly two weeks to emerge. Pelton’s friends had claimed that the chip-swiping occurred after the tourney had completed, but that tale wasn’t quite true. When Pelton and Bolek reached heads-up play, the two agreed to an unofficial chop, with Bolek getting an extra $6,000 from Pelton’s “official” $47,000 first prize, while Pelton received the Casino Championship points and the ring. The points were important, because they made Pelton the leader of the Palm Beach stop’s WSOPC series, and made Pelton the leader — and he would have been the winner — of an automatic entry into the season-ending $1,000,000 tournament in Atlantic City in May. The problem was, the chop had to be unofficial, and a private deal between the two players, since such chops are not allowed under Florida law or tournament and casino policy. Therefore, in order to officially conclude the event, Bolek had to dump his chips to Pelton in a short series of hands. It was during this sequence that Pelton pocketed the chip, and he apparently did so openly enough that one of the tourney directors noticed it. And he did it while the tourney was still officially in progress. From a legal standpoint, the Palm Beach Kennel Club and the WSOPC had very little choice — they had to disqualify Pelton. That much is clear. And, since a rash of these chip-related capers seem to be emerging, they needed to make a statement. That came in the form of a permanent ban for Pelton from all Harrah’s-owned properties, nationwide, meaning Chan Pelton won’t be adding any more WSOPC or WSOP cashes to his poker resume. Bolek, for his part, comes out shining like the sun. His unofficial chop may have been technically against the rules as well, but since there was no theft involved, he ends up profiting from Pelton’s subsequent stupidity. Jeffrey Gunnip, who was second in the overall PBKC Casino Championship before Pelton’s disqualification, also profits, picking up the free WSOPC Championship forfeited by Pelton. WEST PALM BEACH, FL – An investigation into an incident which occurred during heads up play during Event #9 of the WSOP Circuit Event at the Palm Beach Kennel Club on February 16, 2014 has been completed. An act of theft of poker room property – the removal of a poker chip off the poker table – by one of the two remaining players in the event – was confirmed by video surveillance and by the perpetrator in question, who later returned the stolen chip. PBKC’s review confirms that the integrity of the event was in no way compromised, and the impact of the incident only caused harm to the perpetrator himself. The chip stolen came from the players’ own stack – and impacted only his chances of winning – but the act itself is a violation of WSOP Tournament Rule 39, Section A, Part ii (chip stealing) and is also considered theft of property. The player’s intent in taking the chip is not considered by the WSOP Tournament Rules. As a result of the incident and in accordance with tournament Rule 39, Section D, the player in question is disqualified from the event, effective the time the act was confirmed to take place. The remaining player in the event is now declared the winner and will be awarded the first place prize money, the WSOP Circuit ring and the first place points for WSOP National Championship tracking purposes. The perpetrator of the violation of tournament rules in addition to being disqualified also has his prize money forfeited and his points rescinded. The forfeited prize will be redistributed to other players who cashed in the event, consistent with WSOP Tournament Rule 44. “As operators, we must follow the rules – just as we expect players to follow the rules – and any violation of the rules, must be dealt with in a manner that ensures integrity of the event in question, as well as future events. If rules infractions occur, we view incidents in the worst case scenario plausible, and as such impose penalties governed by our rules to ensure the best possible outcome for all players in the future and to best ensure integrity of events on a going-forward basis,” Carbone added. In accordance, the PBKC is also extending a permanent ban of this patron from participating in future events at its property. While the perpetrator was originally suspended from participating in the event’s Main Event, now that the final investigation is complete, it has been determined that this individual will not be allowed on PBKC property in the future. As this was an officially-sanctioned World Series of Poker Circuit event, the WSOP will provide its own statement as to how this incident impacts the WSOP National Championship and any additional disciplinary action they consider. Earlier today, Palm Beach Kennel Club made a decision regarding the outcome of a ring event that took part in their Circuit series thre earlier this month. You can read that statement here. As a result of a violation of tournament rules in the World Series of Poker Circuit event at the Palm Beach Kennel Club for Event #9 on February 16, 2014, we will honor the action taken by the host property, PBKC, and have added additional consequences as a result. This impacts the PBKC Casino Champion award and automatic qualification into the season-ending $1,000,000 WSOP gold bracelet event at Bally’s Atlantic City May 22-24, 2014. The individual who admitted the theft and violation of tournament rules will no longer be eligible for the National Championship and is also being served an indefinite suspension from all WSOP-related events taking place at Caesars-owned properties, effective immediately. This suspension is a company wide casino ban, forbidding the individual to step on any Caesars-owned property in the future. Failure to comply will result in trespassing charges, and possible further law enforcement. The WSOP will also make aware of this incident and ban to any non-Caesars owned property that conducts events with us, including Circuits and international events. The individual with the second-most points at the PBKC WSOP Circuit event has been notified, and will be awarded the Casino Champion title and automatic seat into the National Championship event in Atlantic City. We strive to give poker players of all levels a fair and equitable opportunity in our events. Anything that impacts this objective will be dealt with using the full extent of our rules, regulations and law enforcement tools at our disposal. Please be aware of our tournament rules and ensure 100% compliance. All told, that’s a severe but deserved penalty for Pelton, whose two earlier wins in WSOPC events are also now under at least a generalized cloud of suspicion. And yes, it could have been worse. Though not addressed in any of the releases, it’s likely that Pelton could technically have faced criminal charges for the theft, had the PBKC or WSOPC wished to press the issue.